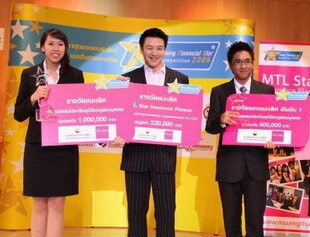 Young Financial Star Competition 2009 (YFS) arranged by The Stock Exchange of Thailand, Muang Thai Life Insurance, PTT, Kasikorn Bank, Thai Investors Association and together with other alliances, is a program to produce new-generation stock analysts and financial planners. Contestant has competed over 5 months among 3,125 students around the country. There are 4 program associated with this completion; SET Star Researcher, MAI Star Researcher, K Star Financial planner and MTL Star Insurance planner. In which each program required special knowledge and specialties. During the period of five months, there are several invaluable experiences such as Researcher and Planner Camp, and Money Adventure, in which we have worked on CSR projects. 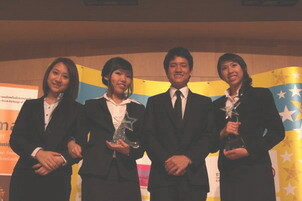 We all have to submit the report for each specialized line of competition and conducted on-stage presentation in front of a panel of five judges. Ms. Nutnicha Sankosik, and Mr. Norrarat Sukumpanumet made it to the semi-final round in which they received scholarship worth of 60,000 and 30,000 Baht respectively. In addition, Mr. Norrarat and his teammates also won the PTT CSR award, in which they secured 10,000 Baht cash per person. Congratulations! On all of the five BBA students receiving this highest recognition in YFS once again!! Posted date: February 2, 2010 � 10:00 hrs.